"I’m an AI enthusiast, and I’m really here for exploration and to learn from people in the field - and of course to support women in the field." As well as keynote presentations, there will be an opportunity for attendees to engage in a short Q&A with the speakers to learn more about their work. Who will we learn from in Houston? Giewee Hammond is the Lead Data Scientist at Aramco Services where she directs and oversees the design and development of systems used for managing data such as data infrastructure, data stores, and other business intelligence systems. She enjoys empowering individuals with information that will better their circumstances. She has volunteered with various Houston, TX organizations that encourage STEM after-school programs and has acted a mentor for undergraduate students that are starting careers. Dr. Kanchi is a postdoctoral fellow in the Department of Diagnostic Radiology at the University of Texas MD Anderson Cancer Center (MDACC). Dr. Kanchi’s research focuses on the use of bioinformatics and machine learning methods in order to understand the diverse data types in cancer genetics. Her current work deals with learning from radiological image data such as MRI, PET and CT. Dr Kanchi is committed to a responsible conduct in research (RCR). As chair of the RCR subcommittee of the postdoctoral association at MDACC, she organizes monthly RCR lectures on various RCR topics and spreads awareness about performing research responsibly. She is strongly interested in bioinformatics, statistical genomics and machine learning. At Alice, Courtenay Siegfried is a founding partner and VP of Communications and Impact. Alice (HelloAlice.com) was the first AI platform designed to help business owners find the right path to start and grow their companies. Prior to Alice, Courtenay lived the entrepreneur life as owner and president of 20K Group, a global communications agency. She also co-founded Launchpad Skills for Success, a training company specializing in emotional intelligence and business communications. Courtenay is active in her community and currently serves on the League of Women Voters of the Houston Area Board of Directors and Discovery Green Programming Committee. Margaret is a Vice President of Software Engineering for Conversational AI Platforms at Capital One. She sets the technology strategy for Eno, Capital One’s banking chatbot, as well as enterprise messaging capabilities for email, push and SMS. Margaret is also an advocate for closing the gap in women in technology as a member of Capital One’s Women in Technology working group. Margaret has been with Capital One for 20 years, in roles of increasing responsibility within Technology and Operations. She holds a BS in Operations Research & Industrial Engineering from Cornell University and her MS and PhD from Lehigh University in the same field. Prior to joining Capital One, she spent three years as an Assistant Professor at the University of Virginia, in Systems Engineering. Her research interests have been varied, but always along the common theme of using technology to solve complex business problems. Margaret is a board member of CodeVA.org and the Computer Science Industrial Advisory Board at Virginia Commonwealth University. We’d also like to say a huge thank you to Capital One, our sponsor for the evening who have helped make the dinner possible. Margaret will also be presenting at the Applied AI Summit on November 29 - 30, where she will be sharing her work on ‘Creating Applications That Converse, Understand and Become More Intelligent’. 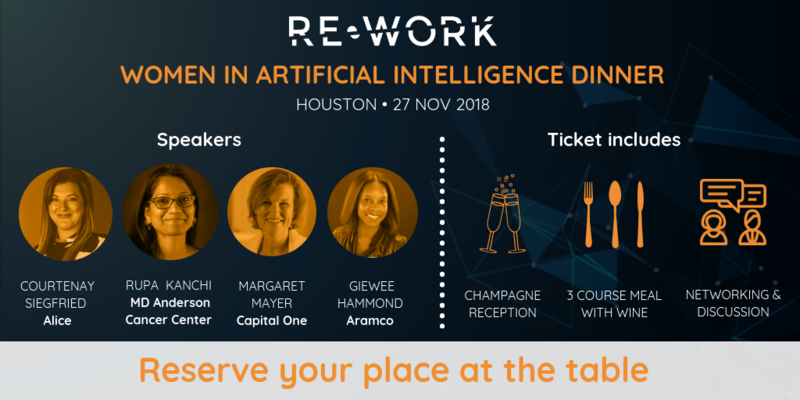 Additional confirmed speakers include the following: Sandeep Golkonda, Sr Spl Data Scientist, AT&T; Joseph Michiels, Senior Product Manager Shipping Data Science, eBay; Prakash Mall, Senior Director - Robotics Process Automation and Chatbots, Target; Amy Gross, Founder & CEO, VineSleuth; Sunanda Parthasarathy, Associate Director Data Science, Wayfair.